Following a health scare with one of my dogs in 2007, I set off in search of some answers. 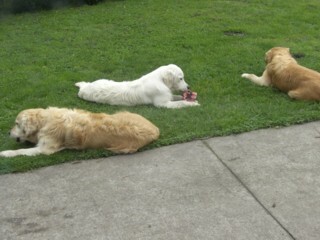 3 of my dogs enjoying their daily raw meaty bone. 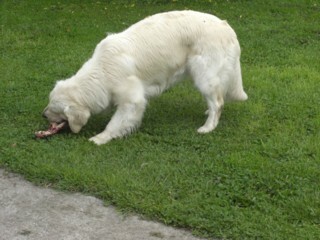 After a lot of research and book reading I made the decision to change my dogs diet to raw feeding. Raw meat and bones/offal/eggs and ground veggies of all types. At first it is a bit scary, after all, we have been “brainwashed” for years by “officials” that only kibble can meet all the full nutritional needs of a dog. Considering I have brought up 2 healthy boys and I didn’t need to feed them a “complete and balanced” meal 3 times a day every day, then feeding dogs is not that hard. If you feed a variety of different meats and raw bones and veggies, the need for any supplements is minimal. A couple of times a week mine get a little coconut oil, kelp powder. I add an egg every day. Of course my dogs love fish so they get some tinned sardines or mackerel from time to time. It really is just common sense. 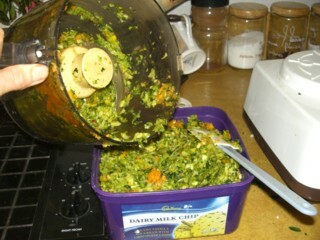 Example of raw veggie mix. Also known as B.A.R.F. (Biologically Appropriate Raw Food). 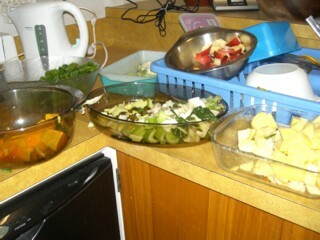 Preparation of the vegetables for veggie mix. Scarlett now 5 .5 years old, has only ever been fed this way. All my litters are now raised this way, with instructions in my Puppy Manual. The first 3 books here are very easy reading.